Vampire hunter Damon Brock's first assignment with the Execution Underground is Rochester, New York. But he isn't the only hunter in town gunning for vamp blood. Tiffany Solow is ruthless when it comes to slaying the monsters that destroyed her family--and she works solo. But when she meets the mysterious hunter who wants more than just her turf, the line between good and evil blurs as they must decide between their lifelong beliefs...and their newfound desires. Loved reading these books! 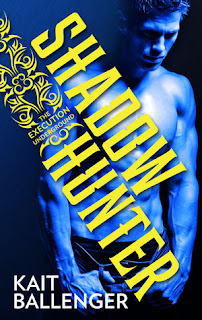 Though it was hard to read Shadow Hunter, knowing it would have to end badly-since his book is supposed to be number 6. When books 4 and 5 haven't come out yet. Yeah. It was just so great to read them, though! I loved this world! It had some of the more standard paranormal creatures-vampires, werewolves and ghosts, as well as demons, and shifters that weren't wolves. Oh, and fae, and skinwalkers! So yeah, a good collection of species, and I enjoyed the rules in this book! Shadow Hunter is where Damon picks out his team, though they aren't in it. It was great to see him when he was happy, or more normal, because how he was in Twilight Hunter wasn't very likable! But it's understandable, knowing what happened! I'm thinking that the memory that Jace had of his father killing his grandfather was real. What I don't get, is how he could be 150, and that his father would be mentioning Tupperware. But now that I'm thinking about it-they are long lived, then it could work. But then what about his grandmother? Confused=me! Loved reading these books, and I can't wait to read more! And I hope we get the rest of this series! Reason Why: Sounded really great, and they're Prequel & Sequel Challenge 2016 Books!